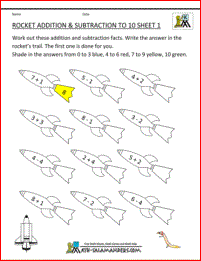 Welcome to our Addition Subtraction to 10 Coloring Sheets for Kindergarten. Here you will find our range of free printable Kindergarten Math Worksheets, which will help your child learn to add and subtract up to 10. Our sheets have different fun themes involving animals or rockets. 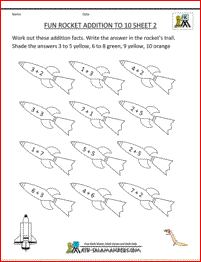 Here you will find our range of Free Addition Subtraction to 10 Coloring Sheets. 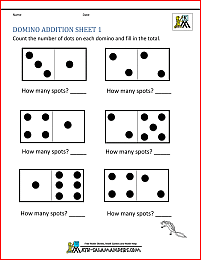 The following worksheets involve using adding and subtracting skills. The sheets are carefully graded so that the easier sheets come first and the level of difficulty gets gradually harder. All the sheets involve coloring in different answers. Looking for some easier addition and subtraction sheets? We also have addition and subtraction worksheets within 5. The sheets are similar to those on this page, but the maximum value is only 5. Here you will find a range of Free Printable Kindergarten Addition and Subtraction Worksheets. The following worksheets involve adding and subtracting to 10.
add and subtract up to 10. 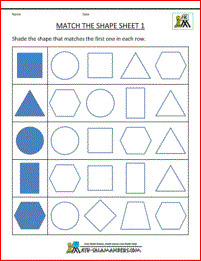 All the free Math Worksheets in this section are informed by the Elementary Math Benchmarks for Grade K.
This webpage is all about identifying 2d shapes. The sheets explore squares, rectangles, circles and triangles, and also matching identical shapes. There are also some shape tracing worksheets to help your child learn to name 2d shapes and practice tracing them to improved their fine motor skills. There is a section of preschool shape worksheets which are at a very basic level, and a kindergarten shape worksheet section with a wider range of shapes in different orientations. 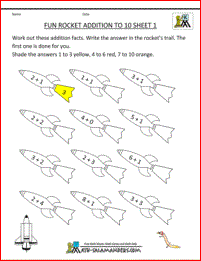 The math worksheets for kindergarten on this webpage are all about measuring length in inches and centimeters. There are two different easy activities. The first activity is to write down the number on the ruler pointed to by an arrow. The second activity involves writing down the correct measurement for the length of a line - a ruler has been correctly positioned underneath.